04-Feb-2006 -- This Confluence lies on the border of Namibia and Botswana. The international border is the 21°E line and we hoped to be able to reach the Confluence from the Namibian side via Kaudom National Park. Kaudom is tucked away in the Northeast; it covers 4000 km2 and is amongst Namibia's remotest national parks. It's a wonderful place, not only due to the variety of animals you may encounter, but moreover the isolation and almost guarantee to have it to yourself. This was our third trip and we have yet to encounter another vehicle in the park. In the dry season much game frequents the waterholes, most notably elephants, but at this time of year the park is wet and overgrown offering limited visibility. Carnivores are well represented and we have been very lucky with wild dogs on our last two trips. There are no roads in the park that afford access to the Confluence but we guessed there had to be an international boundary road of some description, which would lead us there. Our vague inquiries produced results, as a park official conceded the existence of a boundary road, dismissing it as overgrown and impassable. We thought we would give it a go! Seven km south of Sigaretti camp is the park boundary and a wide firebreak has been cut heading east towards the Botswana border, 30 km away. The 7-foot high grass proved passable and on arrival at the border we were confronted with a high game fence running along the 21°E line. 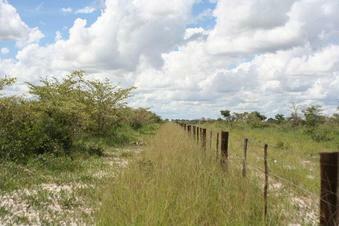 We then had 18 km to navigate driving north alongside the fence on a very overgrown and little used path. As we had begun to suspect while approaching the Confluence, the nearest point accessible from the Namibian side fell agonizingly short, just 128 metres away! Defeat at this stage wasn't an option, so while Hanne waited with the vehicle, I crossed the game fence only to find another fence now just 106 m short! Hopping over this fence now put me into no-man's land and inside the needed 100 m. A third fence (to enter Botswana) was tempting in order to get "zeros", but the nasty looking electrification and realization that my passport was in the car finally got the better of me, 77 m short. The border with Namibia is running approx. 130 m west of the Confluence.